These figures were released as part of the promotion for the 7th Pokemon movie Sky-Splitting Visitor: Deoxys (裂空の訪問者 デオキシス) in Japan or Destiny Deoxys in USA. 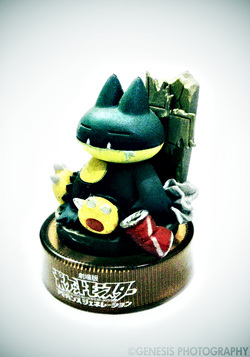 However, these figures, like all other bottlecap figures, are released exclusively in 7-11 Japan. This set contains 8 figures of Pokemon that starred in the movie. This Pikachu was acquired from togoboldly of PKMNCollectors. It was the last bottlecap figure needed to complete the set. 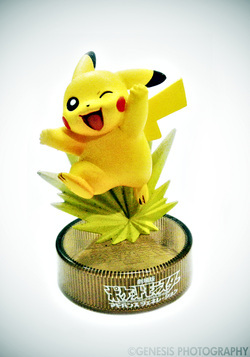 It has the same mold with all other Pikachu bottlecap figures with the difference only in the background. Munchlax was one of the first few bottlecaps in my collection together with Manaphy and Plusle. It shares the same mold with the Munchlax in the Pokemon Movie '08 set with the only difference in background and color of Munchlax itself. Plusle here was one of my first bottlecap figures, it has been looking for its sibling Minun for quite a while. They were later reunited when Minun was acquired from a set in eBay. Minun here was a gift from a friend which he got cheap from a Japanese toy store. It was dirty at that time and without its base. Fortunately it was easy to clean and I managed to find a base that fits it. Its sibling Plusle was later acquired from mamath of PKMNCollectors. 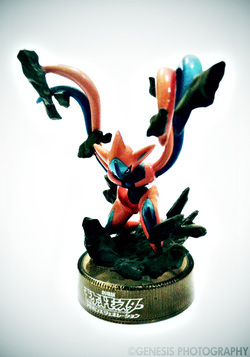 Deoxys was bought from mamath of PKMNCollectors. There is not much difference from its 10th Anniversary counterpart besides the color of the earth. 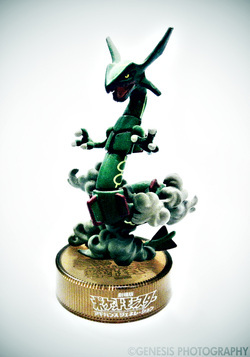 Rayquaza was obtained from a set in eBay together with Plusle, Minun and Munchlax.